L. 1. The Bill of the King's Majesty's General Pardon. L. 2. The Bill for the King's Majesty's General Pardon. L. 3. 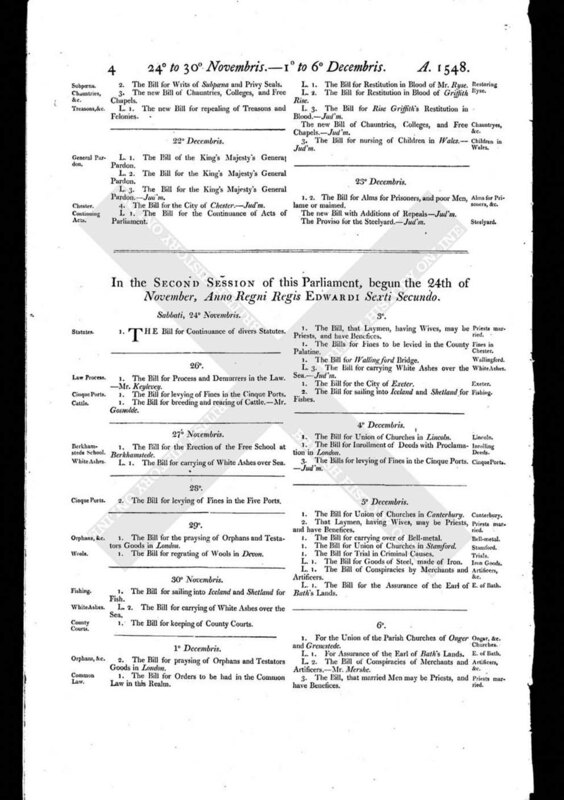 The Bill for the King's Majesty's General Pardon. - Jud 'm. 4. The Bill for the City of Chester. - Jud'm. L 1. The Bill for the Continuance of Acts of Parliament. L. 1. The Bill for Restitution in Blood of Mr. Ryse. L. 2. The Bill for Restitution in Blood of Griffith Rise. L 3. The Bill for Rise Griffith's Restitution in Blood. - Jud'm. The new Bill of Chauntries, Colleges, and Free Chapels. - Jud'm. 3. The Bill for nursing of Children in Wales. - Jud'm.